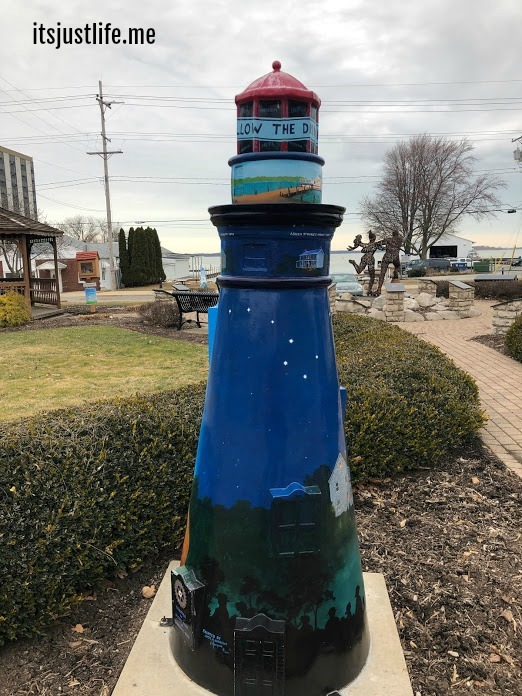 Lighthouse lovers will all love a visit to Sandusky, Ohio. 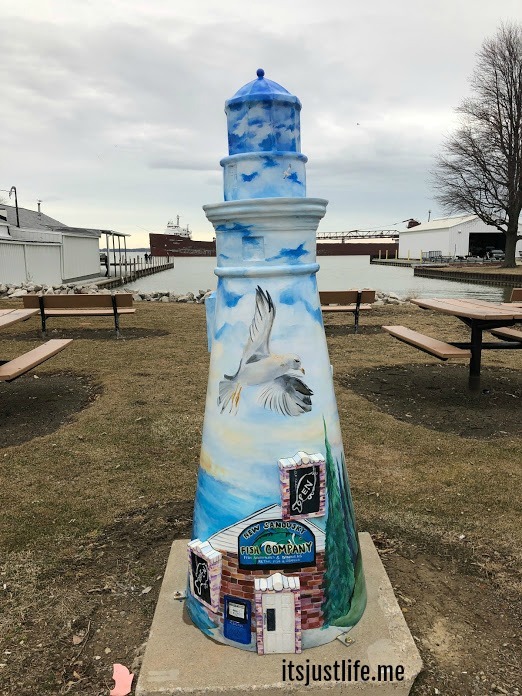 Located in northern Ohio on the shores of Lake Erie we found Sandusky to be a nice little town to explore even on cold rainy days in March. While there are quite a few things that bring in visitors during the summer months we found the area to be busy with spring breakers taking advantage of the various indoor water parks while we were there. 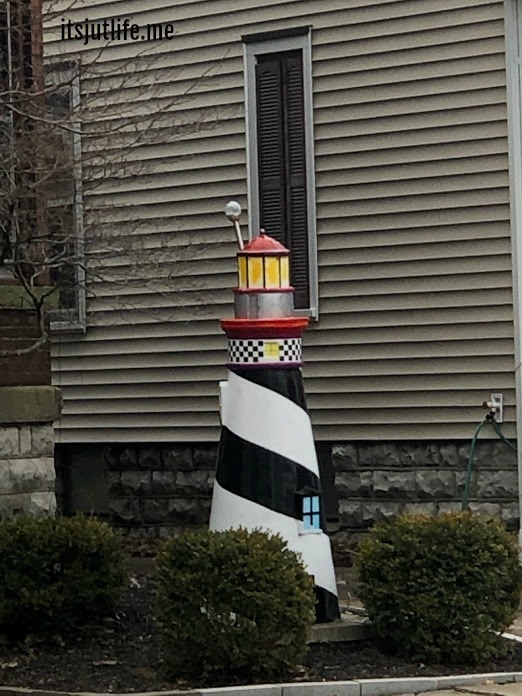 I always get excited when I see lighthouses and Sandusky boasts quite a few “little” lighthouses sprinkled around town. I found out that there was no map of these but they were a fundraiser years ago for the Merry Go Round Museum. They were raffled off and many are located in front of businesses or inside buildings and we found quite a few of them in our walking around the downtown area. With a population of just under 26,000 Sandusky is a nice sized community with a lot going on. We were happy to see that there was a lot of construction going on and the area was getting revitalized. The architecture and predominantly limestone buildings were really beautiful and as we walked the downtown it was apparent that Sandusky is trying to keep up with the times. And who doesn’t love creative artwork decorating downtowns? 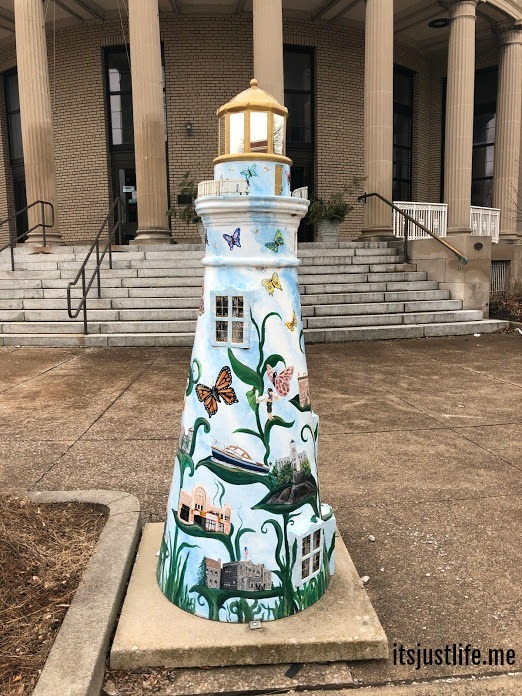 I have had the pleasure of seeing quite of few of these unique type of fundraiser arts from cows to dauphins to pigs to peanuts to bears and now lighthouses. The perfect way to market a town and let folks enjoy some creativity at the same time. Thanks for strolling the streets of Sandusky, Ohio with me today. I promise to share more about this lakeshore town next week. 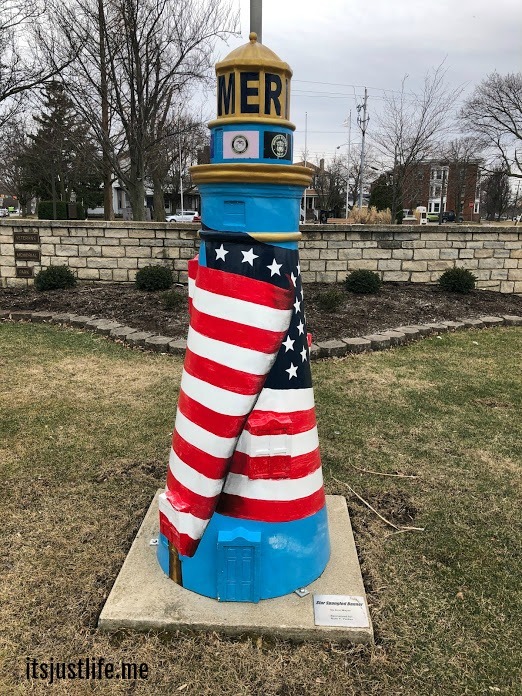 Tell me, does your town do anything creative like this ? I would love to hear about it in the comments and remember to Comment for a Cause for Camp Robin Rogers. You can read more about that by clicking here. Love Marblehead! Visited a couple years ago. Just beautiful! Marblehead is my favorite place and holds os many memories for me. Did you happen to go to Lakeside as well? It is hopping during the summer season but not so much last week when we stopped by. 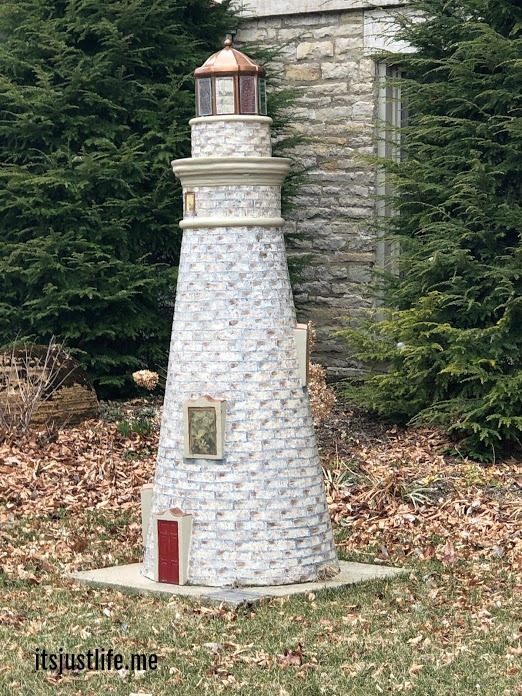 For someone who loves lighthouses, these little lighthouses are amazing! What a great idea. In Vancouver the fundraiser featured orcas and it was great to see them everywhere. Oh orcas would be awesome! I love these ideas!!! We’ve gone to Fripp Island for over 35 years and I just climbed the lighthouse on Hunting Island in March! It was wonderful! That is a great lighthouse to climb. I climbed it the last time we were there and it was an amazing view. Might have had “lighthouse ” legs the next day but it was worth it. Oh my goodness! I told Chris we need to go visit! I love them! Thanks for sharing your posts so I could see Punxsutawney! Love it! Wonderful photos- and I especially liked the one that also showed a freighter in the background. Yep, Sandusky is the big city in that neck of the woods! Cleveland featured guitars a few years back- they looked great! The artwork on these is amazing. I’ve always visited Sandusky for the roller coasters and now have a new reason to explore beyond the amusement park. I love when a community takes a theme like this and runs with it in creating public art. That gives a community a cohesiveness that’s memorable. You and I both love this kind of stuff and when the project is done as a fundraiser for a good cause it makes it even better. 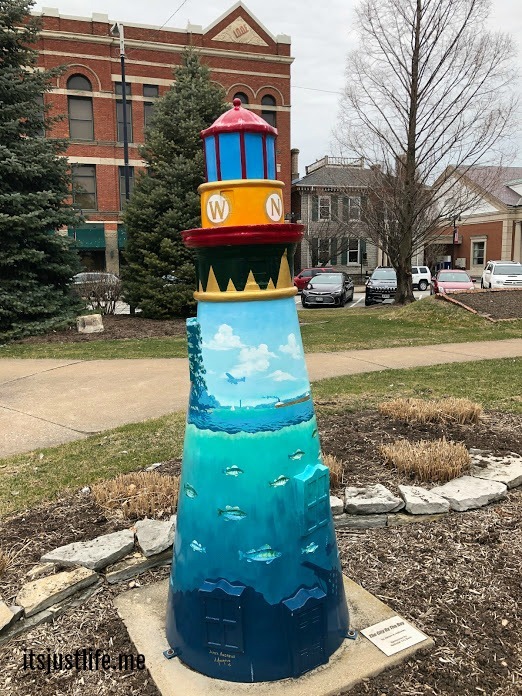 I loved these lighthouses. 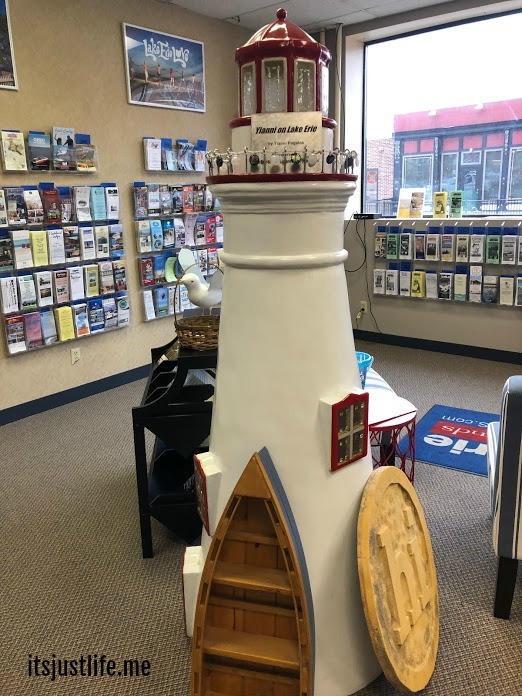 My what amazing decorative lighthouses!!!!! Being a Surry and Smithfield, VA girl, I have to admit I am very proud of Smithfield for taking on a community theme now for quite a few years. Bring back a lot of the history of our town and making it very people and tourist friendly. They are so cute.. I need to make a trip to Smithfield sometime – everything I have heard and seen makes me believe that I would love it as well. I remember how much fun we had at Cedar Point. It’s fun going back through your post to explore virtually. We did have fun at Cedar Point! Other than the scary people chasing you….and the stupid comments. 🙂 Sandusky has a really nice downtown and we had a nice couple of days just chilling out there. These are awesome. I love when you can go around a place and find things like that. In Berlin there are bears all over the city. Berlin’s mascot is a bear so bears were chosen for this art installation and now they are all over. Oh I bet the bears in Berlin are amazing. I love it when I stumble upon something like this and have the chance to take some pictures. These were unexpected and fun. 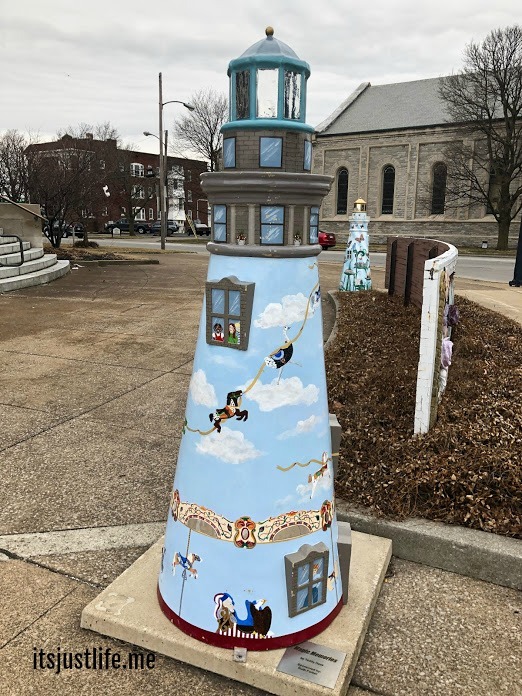 Thanks –lighthouses are always such fun to find and these mini ones were a nice surprise.